Ristorante Al Frate I Mangiare Bene I Città di Brescia – Il ristorante più storico di Brescia, dove la buona cucina si mescola alla tipica ospitalità bresciana per farti sentire a casa tua. CINZANO VERMOUTHS DATE BACK TO 1757 AND THE TURIN HERBAL SHOP OF TWO BROTHERS, GIOVANNI GIACOMO AND CARLO STEFANO CINZANO, WHO CREATED A NEW “VERMOUTH ROSSO” (RED VERMOUTH) USING “AROMATIC PLANTS FROM THE ITALIAN ALPS IN A [STILL-SECRET] RECIPE COMBINING 35 INGREDIENTS (INCLUDING MARJORAM, THYME, AND YARROW)”. WHAT BECAME KNOWN AS THE “VERMOUTH OF TURIN” PROVED POPULAR WITH THE BOURGEOISIE OF TURIN AND, LATER, CASANOVA. CINZANO REMAINED A FAMILY-RUN BUSINESS UNTIL 1985. BEGINNING THAT YEAR, THE MARONE FAMILY, TURIN INDUSTRIALISTS, BEGAN TO SELL SHARES IN THE BUSINESS, CULMINATING IN 1992 WITH AN AGREEMENT TO TURN CINZANO INTERNATIONAL S.A. ENTIRELY OVER TO INTERNATIONAL DISTILLERS & VINTNERS, A WHOLLY OWNED SUBSIDIARY OF GRAND METROPOLITAN. AT THE TIME OF ITS SALE, CINZANO’S SHARE OF THE VERMOUTH MARKET IN EUROPE WAS MEASURED IN THE LOW SINGLE DIGITS, SALES THAT PLACED IT A DISTANT SECOND TO MARTINI. CINZANO WAS WELL KNOWN IN BRITAIN FOR ITS HUMOROUS TELEVISION ADVERTISEMENTS FEATURING LEONARD ROSSITER AND JOAN COLLINS. ONE OF THESE FEATURED THE PAIR ON A PLANE JOURNEY, WITH ROSSITER ACCIDENTALLY HITTING THE “RECLINE” SWITCH ON COLLINS CHAIR, CAUSING HER TO SPILL A GLASS OF THE DRINK OVER HERSELF. Il materiale presente sul sito, compresi i filmati, non potrà essere riprodotto, comunicato o distribuito senza l’autorizzazione dei rispettivi titolari dei diritti d’autore, diritti connessi, altri diritti esclusivi o loro aventi causa, salve le eccezioni previste dalle leggi vigenti. 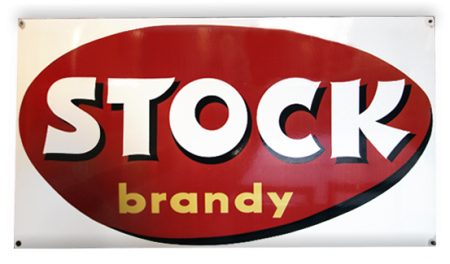 STOCK SRL IS A COMPANY THAT PRODUCES LIQUORS AND DISTILLATES, ITS NAME IS LINKED TO ITS FOUNDER, LIONELLO STOCK, WHO FOUND IT IN TRIESTE IN 1884. DURING THE SIXTIES THE FIRST STOCK TESTIMONIALS WERE SANDRA MONDAINI AND RAIMONDO VIANELLO INTHE FAMOUS CAROSSELLO ADVERTS. IN 1966 ANOTHER UNFORGETTABLE CAROSELLO ADVERT WAS PRESENTED BY ORSON WELLES AND WITH THE ACTRESS DANISH KITTY SWAN, WHO IN LATER YEARS BECAME FAMOUS WITH FILMS SUCH AS THE VIRGIN OF THE JUNGLE, IN WHICH TELL THE STORY OF A FEMALE TARZAN. IN 1977 RAFFAELLA CARRA CLOSED THE STOCK 84 CAROSELLO ADVERTS – MEANING THE END OF AN UNFORGETTABLE ERA. IN 1997 TO LAUNCH THE LUCKY LIMONCÉ LIQUER, STOCK USED FOOL’S GARDENS FAMOUS SONG; LEMON TREE, USED UNTIL 2009. BIRRA ITALA PILSEN S.P.A. IS AN ITALIAN COMPANY SPECIALIZED IN THE PRODUCTION OF BEER. CURRENTLY IS A BRAND OF THE PERONI BEER GROUP. IN 1916, ARRIGO OLIVIERI, BOUGHT THE CAPPELLARI BEER COMPANY IN PADOVA, FOUNDED IN 1890. 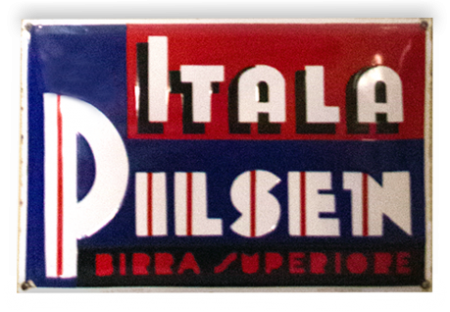 IN 1919, THANKS TO THE FUSION WITH MAURA BEER AND THANKS TO THE ENTRANCE OF A NEW BUSINESS PARTNER (GIOVANNI BATTISTA FRIGO), BIRRA ITALA PILSEN WAS BORN. IN 1948, THE COMPANY EXPANDED. IN THIS PERIOD, IT BECAME THE FOURTH ITALIAN BEER COMPANY, COVERING 7% OF THE NATIONAL MARKET. IN 1950, IT BECAME A S.P.A. AND 50% WAS OF ITS SHARES WERE BOUGHT UP FROM BEER PERONI AND FROM PEDAVENA BEER. IN 1962 THE NEW BOTTLING CENTER WAS INAUGURATED. IN 1970 IT BECAME ENTIRELY PROPERTY OF BIRRA PERONI. TODAY ITALA PILSEN EXISTS AS A PERONI TRADEMARK, WHICH, IN JUNE 2016, ANNOUNCED THE RESTARTING OF BEER PRODUCTION WITH THIS BRAND IN ITS PADOVA FACTORY. LA WÜHRER È STATA LA PIÙ ANTICA FABBRICA ITALIANA DI BIRRA, FONDATA A BRESCIA. 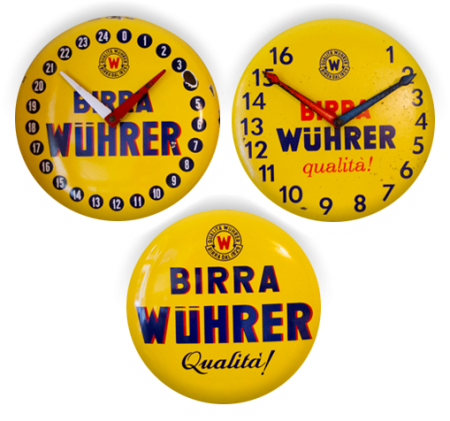 LA WÜHRER È LA PIÙ ANTICA FABBRICA DI BIRRA ITALIANA. FU FONDATA A BRESCIA DA FRANZ XAVER WÜHRER NEL 1829. LA SEDE ORIGINARIA DELLA BIRRERIA WÜHRER ERA NEL CENTRO DI BRESCIA, IN VIA TRIESTE, DOVE ANCORA OGGI UNA TARGA RICORDA QUEL LUOGO. NEL 1889 IL FIGLIO DI FRANZ, PIETRO WÜHRER, EDIFICÒ IN UNA ZONA PERIFERICA DELLA CITTÀ (LA BORNATA), UN MODERNO STABILIMENTO, COMPLETATO NEL 1895. PER DECENNI QUI VENNE PRODOTTA BIRRA E, PER UN BREVE PERIODO, VENNE TENTATA ANCHE LA STRADA DI ALTRI PRODOTTI, TRA CUI LA PRODUZIONE DI DADI DA CUCINA IN GLUTAMMATO. NEL 1935 RILEVA LA SOCIETÀ TOSCANA PASZKOWSKI DI FIRENZE. L’EVOLUZIONE DELLA STRUTTURA SI ESPANSE SINO AL 1959, QUANDO ASSORBE LA BIRRA RONZANI E LA BIRRA BOLOGNA, RAGGIUNGENDO L’ASPETTO CHE HA NEGLI ANNI OTTANTA CON I MARCHI WÜHRER, BIBITAL E NUOVA LAZZARONI. NEL 1969 I FRATELLI MARIA TERESA E PIETRO WÜHRER (1938-2016) RICEVETTERO IL PREMIO DIONISO D’ORO (ASSEGNATO DA PARTE DELLA FEDERAZIONE ITALIANA PUBBLICI ESERCIZI NEL CORSO DEL CONVEGNO NAZIONALE DI BOLOGNA) IN OCCASIONE DEI 140 ANNI DI ATTIVITÀ DELL’AZIENDA. NEL 1981 LA MULTINAZIONALE BSN (DANONE) COMPRA IL 30% DELLA BIRRA WÜHRER S.P.A. E SUCCESSIVAMENTE, NEL 1988, NE ASSUMERÀ IL CONTROLLO CON UN’OPA PER POI CEDERLA NELLO STESSO ANNO ALLA PERONI (IN CAMBIO DI UNA PARTECIPAZIONE DI QUASI IL 20%) CHE CHIUDERÀ LA PRODUZIONE BRESCIANA E TERRÀ SOLO IL MARCHIO. THE CRODO BRAND IDENTIFIES A WIDE RANGE OF ANALCOHOLIC DRINKS, WHICH ARE ALL BORN FROM THE PURE NATURAL SPRING WATER IN THE THE CRODO AREA.THEY ARE USED ALSO AS BASES FOR COCKTAIL DRINKS. CRODINO IS THE MOST FAMOUS BITTER ANALCOHOLIC, BUT THERE IS ALSO CHINOTTO, FIZZY ORANGE, TONIC WATER , GRAPEFRUIT, GASSOSA AND CEDRATA. SOFTÈ HAS BEEN RECENTLY ADDED, DELICATE COOLING TEA WITH TASTE OF PEACH AND LEMON. THE SPRING WATERS OF THE CRODO AREAO, IN THE HIGH PIEMONTE, HAVE BEEN USED SINCE THE 1500’S FOR THERMAL CARE, BUT ONLY AT THE MIDDLE OF THE NINETEENTH CENTURY INDUSTRIAL EXPLOITATION STARTED. SINCE 1995 THE COMPANY IN TERME DI CRODO IS PART OF THE CAMPARI GROUP. 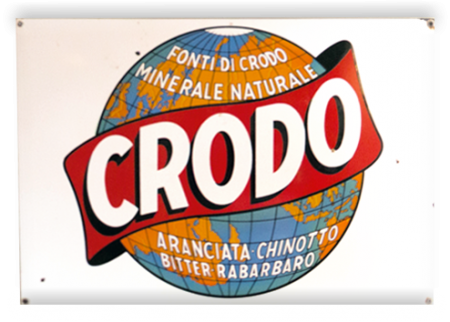 THE MAIN MARKET FOR THE CRODO RANGE IS ITALY. CYNAR IS AN ITALIAN BITTER LIQUEUR OF THE AMARO VARIETY. IT IS MADE FROM 13 HERBS AND PLANTS, PREDOMINANT AMONGST WHICH IS THE ARTICHOKE (CYNARA SCOLYMUS), FROM WHICH THE DRINK DERIVES ITS NAME. CYNAR IS DARK BROWN IN COLOR, HAS A BITTERSWEET FLAVOR, AND ITS STRENGTH IS 16.5% ABV. IT WAS LAUNCHED IN ITALY IN 1952. CYNAR CAN BE TAKEN AS EITHER A DIGESTIVE OR AS A COCKTAIL (MIXED WITH SODA WATER AND LEMON OR ORANGE SLICE, OR WITH COLA, EGGNOG, TONIC WATER, MILK OR BITTER LEMON SODA). EUROPEANS OFTEN MIX IT WITH ORANGE JUICE, ESPECIALLY IN SWITZERLAND AND SOUTHERN GERMANY, WHERE CYNAR AND ORANGE JUICE IS A VERY POPULAR COMBINATION. A VARIATION OF THE NEGRONI COCKTAIL USES CYNAR IN PLACE OF CAMPARI. BECAUSE OF ITS ARTICHOKE COMPONENT, CYNAR IS REGARDED AS A DIGESTIF AS WELL AS AN APÉRITIF. 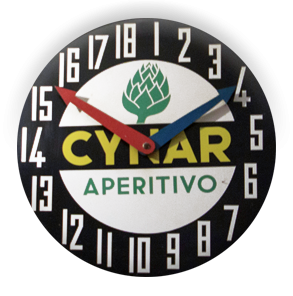 SINCE 1995 CYNAR HAS BEEN MANUFACTURED AND DISTRIBUTED BY THE CAMPARI GROUP. THE LIQUOR BECAME POPULAR DURING THE EARLY 1960S THANKS TO ITS APPEARANCE ON THE ITALIAN TELEVISION ADVERTISING SHOW CAROSELLO. THE SERIES OF COMMERCIALS, FIRST STARRING FERRUCCIO DE CERESA, AND FROM 1966 ERNESTO CALINDRI, SHOWED THE ACTOR SIPPING CYNAR WHILE SITTING AT A TABLE PLACED IN THE MIDDLE OF A BUSY STREET, URGING CONSUMERS TO DRINK CYNAR “AGAINST THE STRAIN OF MODERN LIFE”. TOWARD THE END OF THE SEVENTIES, THE COMMERCIAL CHANGED SETTINGS AND MOVED FROM THE BUSY CITY TO A FIELD OF ARTICHOKES. THE PARTNERSHIP BETWEEN CALINDRI AND THE BRAND LASTED UNTIL 1984. 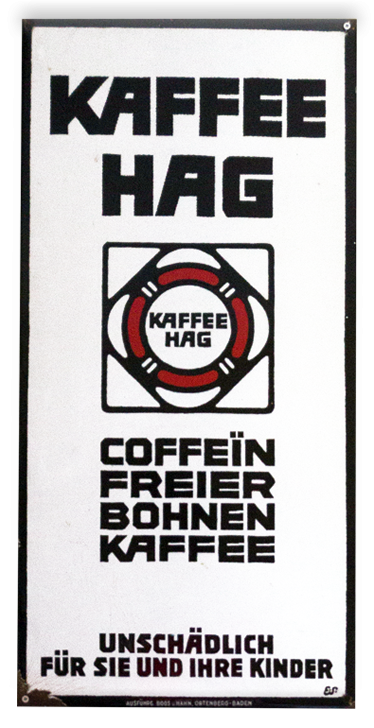 CAFÉ HAG IS A WORLDWIDE BRAND OF DECAFFEINATED COFFEE CURRENTLY OWNED BY JACOBS DOUWE EGBERTS. THE COMPANY WAS FOUNDED IN BREMEN IN 1906 AS KAFFEE-HANDELS-AKTIENGESELLSCHAFT (COFFEE PUBLICLY TRADED COMPANY). THE FOUNDER WAS LUDWIG ROSELIUS, WHO CODEVELOPED THE FIRST COMMERCIAL DECAFFEINATION PROCESS. ALFRED RUNGE AND EDUARD SCOTLAND DESIGNED ICONIC POSTERS AND PACKAGING, AND ARE CREDITED WITH DESIGNS THAT DEFINED THE COMPANY. IN THE 1920S AND 1930S THE COMPANY WAS KNOWN FOR THE PUBLICATION OF THE COFFEE HAG ALBUMS OF HERALDIC EMBLEMS. THE COFFEE BRAND SANKA SPUN OFF FROM KAFFEE HAG IN 1910 FOR THE FRENCH MARKET (“SANKA” IS A CONTRACTION OF SANS CAFÉINE), AND AMERICAN RIGHTS TO THE SANKA NAME WERE SOLD IN 1913. THE KELLOGG COMPANY PURCHASED ROSELIUS’S AMERICAN BRANCH (BASED IN CLEVELAND, OHIO) IN 1928, THEN SOLD IT TO GENERAL FOODS IN 1939. GENERAL FOODS ACQUIRED THE ORIGINAL GERMAN COMPANY IN 1979. IN 1990 KRAFT FOODS MERGED WITH GENERAL FOODS, THUS HAG AND SANKA BECAME BRANDS OF THE AMERICAN COMPANY. THE SPELLING CAFÉ HAG WAS STANDARDIZED IN THE 1990S. HAG HAS BEEN OWNED BY JACOBS DOUWE EGBERTS SINCE 2015. CAFÉ HAG TV ADVERTS WERE POPULAR IN THE 1980S; IN PARTICULAR THE CHARACTER KLAUS (PLAYED BY ROGER CALLISTER) BECAME SOMETHING OF A CULT FIGURE AMONG ADVERTISEMENT AFICIONADOS. OXO IS A BRAND OF FOOD PRODUCTS, INCLUDING STOCK CUBES, HERBS AND SPICES, DRIED GRAVY, AND YEAST EXTRACT. THE ORIGINAL PRODUCT WAS THE BEEF STOCK CUBE, BUT OXO NOW ALSO MARKETS CHICKEN AND OTHER FLAVOUR CUBES, E.G. CHINESE RECIPE AND INDIAN RECIPE. THE CUBES ARE BROKEN UP AND USED AS FLAVOURING IN MEALS OR GRAVY OR DISSOLVED INTO BOILING WATER. IN THE UNITED KINGDOM, THE OXO BRAND BELONGS TO PREMIER FOODS. IN SOUTH AFRICA, THE OXO BRAND IS OWNED AND MANUFACTURED BY MARS, INCORPORATED AND IN CANADA IS OWNED AND MANUFACTURED BY KNORR. ITS SPELLING IS TRADEMARKED AS CAPITAL LETTERS: OXO. AN UNRELATED KITCHEN-UTENSILS BUSINESS, OWNED BY HELEN OF TROY LIMITED, ALSO HAS RIGHTS TO THE OXO NAME. A CONCENTRATED MEAT EXTRACT WAS DEVELOPED BY JUSTUS VON LIEBIG AROUND 1840 AND PROMOTED BY LIEBIG’S EXTRACT OF MEAT COMPANY (LEMCO) STARTING IN 1866. THE ORIGINAL PRODUCT WAS A VISCOUS LIQUID CONTAINING ONLY MEAT EXTRACT AND 4% SALT. 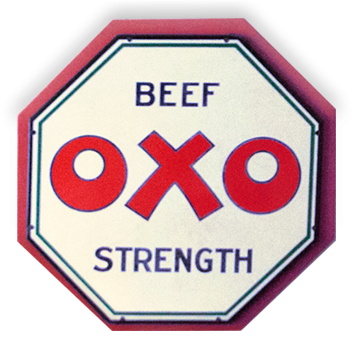 IN 1899, THE COMPANY INTRODUCED THE TRADEMARK OXO FOR A CHEAPER VERSION; THE ORIGIN OF THE NAME IS UNKNOWN, BUT PRESUMABLY COMES FROM THE WORD ‘OX’. SINCE THE COST OF LIQUID OXO REMAINED BEYOND THE REACH OF MANY FAMILIES, THE COMPANY LAUNCHED A RESEARCH PROJECT TO DEVELOP A SOLID VERSION THAT COULD BE SOLD IN CUBES FOR A PENNY. AFTER MUCH RESEARCH, THE FIRST OXO CUBES WERE PRODUCED IN 1910 AND FURTHER INCREASED OXO’S POPULARITY. DURING WORLD WAR I 100 MILLION OXO CUBES WERE PROVIDED TO THE ARMED FORCES, ALL OF THEM INDIVIDUALLY HAND-WRAPPED. LEMCO WAS ACQUIRED BY THE VESTEY GROUP IN 1924 AND THE FACTORY WAS RENAMED EL ANGLO. VESTEY MERGED WITH BROOKE BOND IN 1968, WHICH WAS IN TURN ACQUIRED BY UNILEVER IN 1984. THE OXO BRAND WAS SOLD BY UNILEVER TO THE CAMPBELL SOUP COMPANY IN 2001. CAMPBELL’S UK OPERATION WAS SOLD TO PREMIER FOODS IN 2006. THIS INCLUDED SITES AT BOTH WORKSOP AND KINGS LYNN. THE WORKSOP PLANT PRODUCES OXO CUBES. IN SOUTH AFRICA, OXO IS NOW A BRAND OF MARS, INCORPORATED. THE ONLY PRODUCT MARKETED UNDER THE OXO BRAND IN SOUTH AFRICA WAS A YEAST EXTRACT BASED SPREAD. THE PRODUCT ALSO CONTAINED A LESSER PORTION OF BEEF EXTRACT, GIVING IT A SLIGHTLY ‘BEEFIER’ TASTE THAN OTHER YEAST EXTRACTS. AT THE BEGINNING OF 2015, MARS CONSUMER PRODUCTS AFRICA (PTY) LTD DISCONTINUED OXO SPREAD IN SOUTH AFRICA, WITH NO PRIOR COMMUNICATION TO THE PUBLIC. IN 1908, OXO (ALONGSIDE ODOL MOUTHWASH AND INDIAN FOOT POWDER) WAS ONE OF THE SPONSORS OF THE LONDON OLYMPIC GAMES (DESPITE CLAIMS BY COCA-COLA TO BEING THE ‘FIRST’ COMMERCIAL SPONSOR OF THE GAMES) AND SUPPLIED MARATHON RUNNERS WITH OXO DRINKS TO FORTIFY THEM. DURING THE FIRST HALF OF THE 20TH CENTURY, OXO WAS PROMOTED THROUGH ISSUES OF RECIPES, GIFTS AND SPONSORSHIPS BEFORE FADING INTO THE BACKGROUND AS A PART OF THE FABRIC OF ENGLISH LIFE IN THE LATTER PARTS OF THE CENTURY. IN 1966, OXO HAD A SPONSORED SHOW ON THE OFFSHORE RADIO STATION WONDERFUL RADIO LONDON. THE SHOW WAS PRESENTED BY TONY WINDSOR AND HIS ASSISTANT WAS A WOMAN CALLED KATIE. IN THIS SHOW THEY HAD A DAILY RECIPE. ONE OF OXO’S ADVERTISING CAMPAIGNS WAS LAUNCHED IN THE UK IN 1983, WHEN A SECOND “OXO FAMILY” DEBUTED ON COMMERCIAL TELEVISION. [CITATION NEEDED] THE FATHER WAS PLAYED BY MICHAEL REDFERN, THE MOTHER WAS PLAYED BY LYNDA BELLINGHAM, WHILE THE CHILDREN WERE PLAYED BY BLAIR MACKICHAN, COLIN MCCOY AND ALISON REYNOLDS. THE ADVERTS TYPICALLY FEATURED THE FAMILY SITTING DOWN TO A MEAL AT WHICH OXO GRAVY WOULD BE SERVED. THE PRODUCT WAS NOT ALWAYS MENTIONED BY NAME, OCCASIONALLY APPEARING ONLY AS A LOGO IN THE CORNER OF THE SCREEN AT THE END OF THE COMMERCIAL. THROUGHOUT THE 1980S AND 1990S THE FAMILY WERE SEEN TO GROW OLDER, AND WHEN THE CAMPAIGN WAS RETIRED IN 1999 THE FAMILY MOVED OUT OF THE HOUSE. ON 11 NOVEMBER 2014, IT WAS ANNOUNCED THAT A 1984 OXO ADVERT STARRING LYNDA BELLINGHAM WOULD BE SCREENED ON CHRISTMAS DAY AS A TRIBUTE TO THE ACTRESS, WHO HAD DIED OF COLON CANCER THE PREVIOUS MONTH. IT WAS AIRED DURING THE COMMERCIAL BREAK OF CORONATION STREET. IN OCTOBER 2016, A NEW OXO FAMILY WAS INTRODUCED, FEATURING A COUPLE WITH THEIR TWO DAUGHTERS AND SON. THE FIRST ADVERT SHOWED THE ELDEST DAUGHTER INVITING THE MOST POPULAR GIRL AT HER SCHOOL OVER TO HAVE DINNER WITH HER FAMILY. THE RECOARO CHINOTTO EARNED ITS FAME AS THE NATIONAL ALTERNATIVE TO COCA COLA WITH THE FAMOUS ADVERTISING SLOGAN ‘THE OTHER WAY OF DRINKING DARK’, AND WITH A LABEL THAT HIGHLIGHTED THE TRICOLOR NATIONAL FLAG. 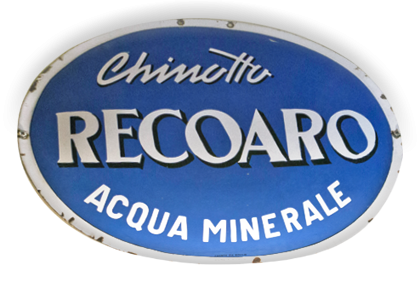 AROUND THE 1950 THE MOST POPULAR CHINOTTO WAS THAT PRODUCED BY RECOARO. QUENCH THIRSTING DRINKS, AN INTELLIGENT APERITIF, MATURE DIGESTIVE, UNIQUE RECIPE FOR COCKTAIL FOR CONNOISSEURS, CHINOTTO IS A CHOICE ‘OUTSIDE OF THE BOX’, NOT ONLY FOR ORIGINALITY BUT ABOVE ALL ABOUT TASTE AND TRADITION. THE CHINOTTO HAS INFLUENCED THE HABITS AND SOCIAL COSTUMES AND AS ALL THE SOCIAL RITUALS, CHINOTTO WAS PROVIDED WITH MERCHANDISE, IN GREAT USE UP TO THE MIDDLE OF THE NINETEENTH CENTURY, THAT CONSISTED IN LIMITED DESIGNS OF ARTISTIC DRINKING GLASSES( EITHER OF ALTARIAN TRADITION OR IN WHITE BLUE STYLE CERAMICS), MADE IN THE ALBISSOLA FACTORY AND FAST BECAME ONE OF THE MOST FAMOUS VINTAGE ICONS OF THE 50 YEARS. A corner in the heart of Brescia where you can remember the past and savour the excellent simple cosmopolitan dishes served by our chef. 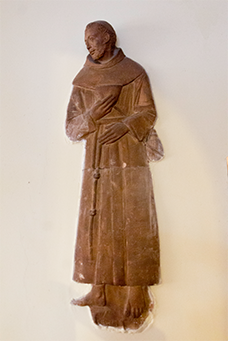 Al Frate Restaurant boasts an ancient history that dates back to the second half of the fifteenth century, when the friars of the castle used to shop in the city to sell their products that were sold in these ancient walls. Soon, in addition to the shop, a way of refreshment was added for travellers, which was perfected and became the main activity. For bookings please phone +39 030 3770550 . Questo sito Web utilizza i cookie per migliorare la tua esperienza. Presumiamo che non vi danno fastidio, ma puoi disattivarlo se lo desideri.